We went to Wittenburg. Which reminds me that our blog is a month behind. Bad bad us. Very bad. I think that we will get coal in our stockings! I have a month to fix that! ... And Merry-Go-Rounds are operated by hand. This is us with Martin Luther himself. And of course we had to climb to the top of the tower. We went to Wittenburg with our friends David and Mary. They are more mature (about the age of my Grandma and Grandpa Toews), and have to climb 4 stories to their apartment. They didn't have any trouble with the church steps! Of course there were bells. And a great view of the festival below. There were so many people! At one point Mary and I were trooping through the crowd and lost Dave and Owen. It took some time, and some climbing on fences, for us to find each other again. I love being able to climb high and bird's eye perspective. Isn't the roof on the church great? It looks like gingerbread! You don't see that from below. When we walked into the church, the one where Martin Luther worked and nailed his Thesis to the door of, the organ was playing "A Mighty Fortress is our God." This was a very neat experience. I had never thought too much about Luther, but he was so instrumental in shaping Christianity to how it is today. In the German History Museum that we went to a couple of weekend ago (see how behind we are in blogging!??!) 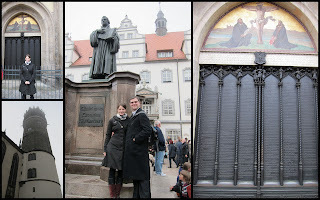 we saw Luther's German translation of the Bible. The first time the Bible was given in the language of the people. These are the doors with the 95 thesis engraved on them. It was a grey, foggy day, and getting dark. But we were able to stop by the monastery which later become Luther's house. He and his wife worked tirelessly to shelter and educate. But let us keep perspective. He was also very anti-semitic. We did have a wonderful day! It was very cool to see that part of history, on the actual day. Thank you - sounds like you had a fun day - a month ago!